It looks like there is going to be two inserts in the paper this weekend. We’ll have one of both Smartsource and Red Plum. Visit, Sunday Coupon Preview for a complete list of coupons. This always helps me know whether or not I should grab that extra copy or not. Keep in mind, each coupon insert is regional and coupons may vary by location. Don’t forget about the other coupon resources as well. You can print from Coupons.com, Coupon Network, and Red Plum. Coupons Jun 23, 2011 in CouponsDotCom, RedPlum, SmartSource, SundayCouponPreview · Expired! Sunday Coupon Preview: Extra Paper Alert! Are you new to couponing or do you want to know what coupons will be in this Sundays paper? Visit, Sunday Coupon Preview for a complete list of coupons. This always help me know whether or not I should grab an extra copy. Keep in mind, each coupon insert is regional and coupons may vary by location. 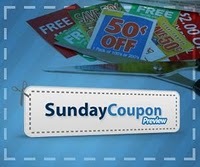 If you want to see what coupons your area will be getting, check out the Sunday Coupon Preview. This Sunday there will FOUR inserts! Two each of Smart Source and Red Plum. This is one of those times where I would by an extra copy of the paper. It looks like there will be over 200 coupons this week! SmartSource has a coupon available for $0.55/1 half gallon of Silk. Get your coupon at SmartSource now, it’s free! Coupons May 2, 2010 in CouponsDotCom, RedPlum, SmartSource · Expired!